You are currently browsing the tag archive for the ‘Follow Alex’ tag. This fantastic poem was created as part of the Find Your Talent children and young people’s reference group at West Yorkshire Playhouse in April. 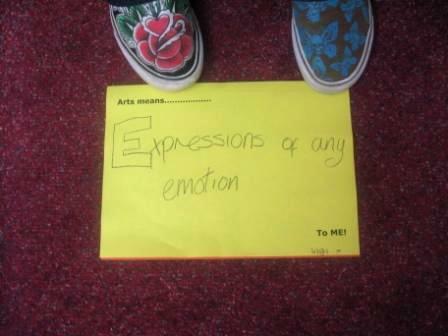 The sessions, run by The Project / Youth Association involved young people aged 12-20 from Inner North West Leeds and explored perceptions of art and culture. This creative approach investigated the role of art and culture in young people’s lives and an ambassador’s group has been formed, Arts Uncovered, which will ensure that children and young people have a voice in the decision making process for all of Find Your Talent’s aims in Leeds. The Arts Uncovered ambassador’s group will engage with children and young people in Leeds, encouraging them to access culture in the city, and will also visit Breeze on Tour whilst participating with the Follow Alex campaign on Facebook. FollowAlex is Leeds City Council’s innovative marketing campaign to support the aims of Find Your Talent and raise awareness of culture amongst young people in Leeds. The communications initiative combines social media platforms like Facebook and Bebo with traditional advertising media, including billboards, bus interior and exterior, bus stations and radio to promote and support the online activity. FollowAlex will encourage young people to find out for themselves what is going on in their city, and through peer endorsement, demystify the barrier that the idea of culture can sometimes create. Join the FollowAlex group on Facebook by following this link here; and keep an eye out for status updates on buses and billboards across Leeds this summer.